Kylie Bedroom Dresser This stylish Kylie bedroom dresser is the kind of cool and classy furniture your child will love for years! Besides being sleek and chic with a soft cream finish, this dresser provides plenty of space for clothes. Plus, it features felt-lined top drawers that are perfect for storing jewelry, collectibles or other special items. This stylish Kylie bedroom dresser is the kind of cool and classy furniture your child will love for years! Besides being sleek and chic with a soft cream finish, this dresser provides plenty of space for clothes. Plus, it features felt-lined top drawers that are perfect for storing jewelry, collectibles or other special items. I haven't had new bedroom furniture in a VERY long time and my old furniture was splintering into toothpicks. I dreaded looking for a new dresser because I have a very small bedroom and not a lot of leeway to move things around, so I needed a dresser that was 52" wide or smaller. 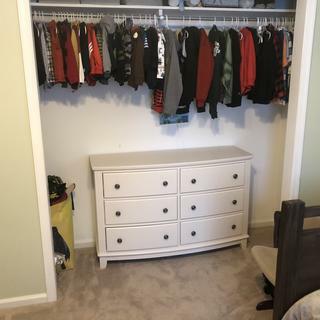 My old dresser was probably for a children's room, because the drawers were so shallow. Well, this new dresser really fit the bill! Deep drawers (Lined! Ooh, boy, I'm living in luxury now!). Simple lines (Love the curved front!). Drawers that open gently and quietly. Very, very nice dresser and I'm extremely happy with it. The only reason I gave it four stars instead of five is that when I open the drawers, they don't quite stay open. They slide back a bit before stopping. Not a deal-breaker. This is a very high quality dresser at a very affordable price. It goes beautifully in my room along ith my other furniture and I just love it. I highly recommend it and Raymour and Flanigans. We just brought the entire Kylie bedroom set for my daughter. It looks even better in her room than at the store. It is beautiful, nicely made and great quality. Really really love it!!!! set looks beautiful in my 8 y/o's room; definitely furniture she can grow with. This dresser is perfect for our bedroom. It is well made and looks beautiful. Fits perfectly in her room. Perfect size for an 11 year old. Fits all her clothes in it. Durable construction. Looks very nice in the room. And it will last her as she grows. Perfect fit!!! Got this piece for our 6 year old daughter. She loves it! Got it in white. It looks beautiful and matches her room perfectly. The drawers open and close nicely. Bought 2 sets of this bedroom set for my 2 4 and 5 year old granddaughters. It looks great in their rooms. Dresser is high quality, drawers close gently, good quality set that will grow with the kids. LOVE IT! Needed to furnish extra bedroom; this dresser was exactly what I wanted and needed. I love the simple, clean lines, and the space in the drawers. It is " just perfect ". My daughter loves her new bedroom set which include this dresser. I love this color and the size was perfect !!! Going back for matching Nightstands ! Bought these for spare bedroom when granddaughter stays over. Makes her feel like she has a princess room. Well built. Very beautiful dresser and just the right size. The length is not as long as most dressers like this that come with a mirror option. My only reason for not giving 5 stars is the drawers do not open and close as smoothly as I would like. My daughter loves it! This is a perfect size kids dresser. The drawers are sturdy, but sometimes hard for the kids and need to be pushed all the way closed, but on the plus side of that is they won’t pinch their fingers. Great addition to our boys bedroom. So happy with this purchase. Drawers slide well - curvature of dresser and night stands adds a special dimension to these pieces - color works well with our decor - it is a soft colored off white and the mirror is a good match for the dresser. Can the drawers be removed if any clothes fall behind them? BEST ANSWER: The drawers can be removed.